A successful blogger always cares about his database because it means great time to him. It is the most essential part of a blogger to run a periodical backup of the database. If you have not yet installed and activated the WordPress Database Backup Plug-in, we request you to read our other article Important things you must do after WordPress installation and install the back up plug-in. Even though the database backup plug-in is available it is always better to know how to manually backup and restore WordPress Database. We provide here a quick guide to Backup and restore WordPress Database manually using phpMyAdmin. 2. Now click on Export, by default all the tables will be selected for export. 3. You should check “Add CREATE PROCEDURE / FUNCTION / EVENT” option if you are moving your database to another host. 4. The default export file format will be .sql (recommended) and check the “save as file” option and hit go browser; it will prompt you to download and save the file in a preferred location. 5. Now, you have completed the WordPress Database Backup manually. 1. Again login to your phpMyAdmin. 2. Now click on Import and select the exported .sql file and hit go to restore. 3. You can update wp-config.php if necessary. 4. Restoring the database in new host is completed. 1. 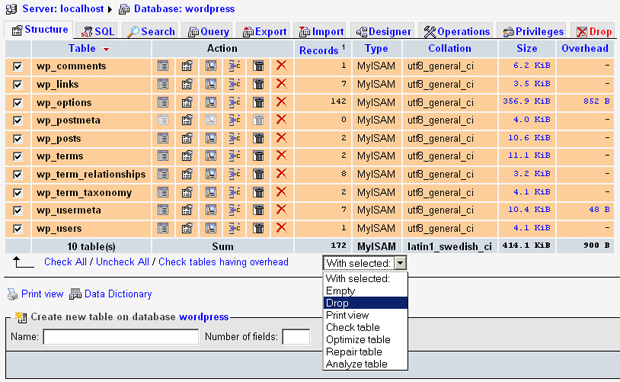 Again login to your phpMyAdmin and select your WordPress Database. 2. Then go to “Structure” tab and check all tables and select drop and hit go to execute the action. Now all the tables will be dropped. 3. Now, click on Import and select the exported .sql file and hit go to restore. 4. Restoring the database is completed. When your ideas, trade and business are involved in the blog that you have created doing the above backup procedure will help you to save your precious time.